Day 36: I'm So Thankful!!! This is a long entry, but I have so many people to thank lately! Today we stayed in Chama most of the day. It’s a tough town to leave! 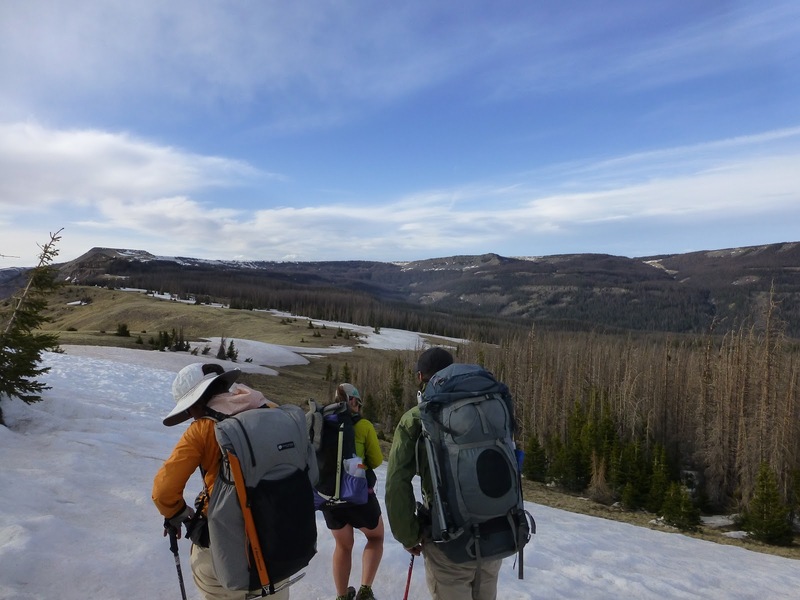 This was our big mail drop where we all got our gear for the snowy San Juan Mountains and it can be overwhelming with all the regular town activities and errands. I surprisingly found it to be less stressful than other stops so far. There was some anxiety as I had five packages of all sizes arrive and only one at the hotel when we got to town. Even though the computer said they were sent, they were not at the hotel I sent them to and I had to go to the post office. The small post office was back logged with the long holiday weekend and the multitude of hikers mailing and receiving packages. 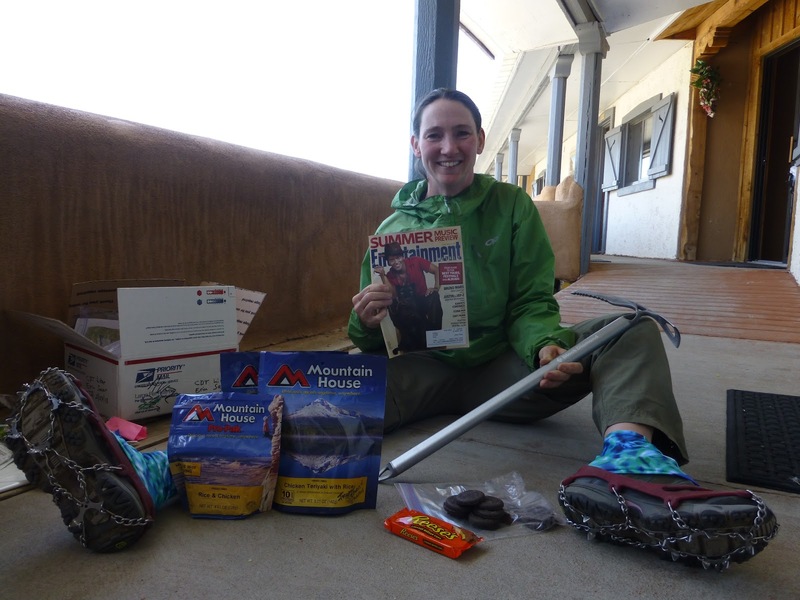 It took hours of repeatedly trying and one by one the packages appeared…my final small package with my snow baskets(for the bottom of my hiking poles) was found just as we were leaving town. Whew! As for the rest of the group there were a lot of us in a small space with pack explosions everywhere and many distractions while still needing to focus on what they need or might want to ship ahead to another city. With the added snow gear weight, we are all minimizing to what we really need. We all have been getting special gifts in our resupplies and I wanted to take this post to mention some of them….most uniquely was the package sent to all of us from Stryder’s mom. While in Pie Town the girls put together a special Mother’s Day card for her to thank her for her son…and also mention how much Stryder had talked about her homemade apple dumplings…and that Chama would be a great place to get a care package. Well, she took the hint and sent the apple dumplings in the most elaborate way possible with dry ice and a note on the package for the postmaster to refrigerate them until we arrived. We thought there was no way that would happen and he actually did it! 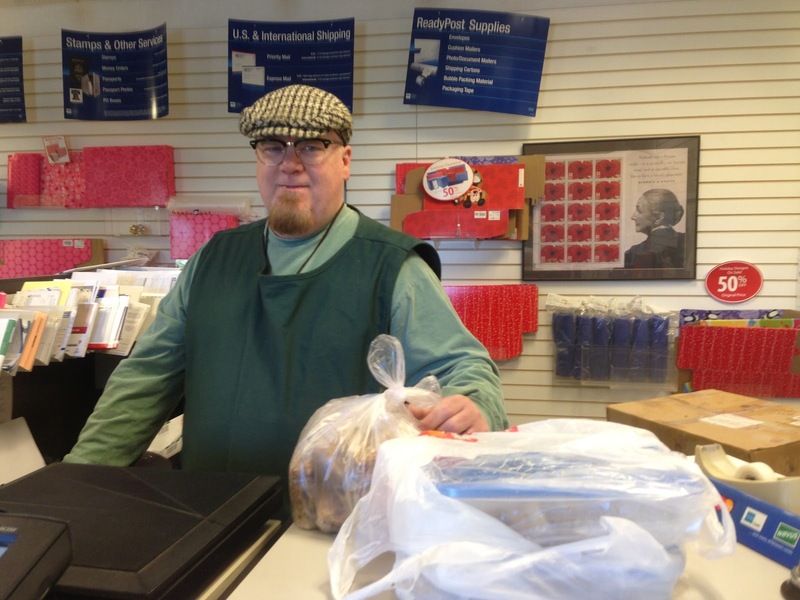 Here is Jim, the postmaster handing over the refrigerated apple dumplings. THANK YOU Jim for your help and THANK YOU to Stryder’s mom for the tasty apple dumplings and the wonderful note that accompanied it! There were so many kind people in Chama. The owner of the Trails Inn where we stayed allowed me to come into her home at the Inn and use her laptop for a few hours. THANK YOU STARLA! Today I was at the local Subway getting a sandwich and trying to get on the wifi and another customer overheard me. He just dialed his cell phone and rang up the Subway’s owner who was right there in no time to assist me. It’s small enough that everyone knows each other. There is even a woman named Patsy that owns the local ice cream shop. She has an empty two bedroom apartment above her shop that she has been hosting hikers in too! Such a wonderful town! 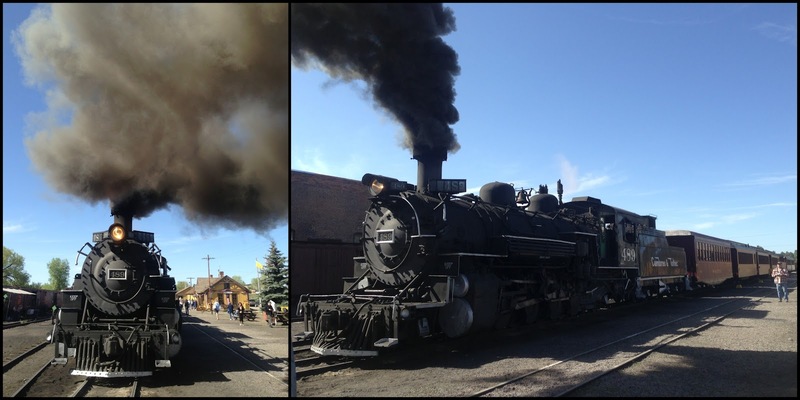 The town’s main income is the scenic railroad called the Cumbress & Toltec. It’s a steam engine train that runs for 64mi through the Toltec Gorge and is highest elevation train in the country(not sure about the world). This morning we were at the post office when we heard the train pull up and we were able to see it up close before it took off. It was really cool! I don’t think I’ve seen Ninja get more excited than when she saw the train. Her dad loves trains. 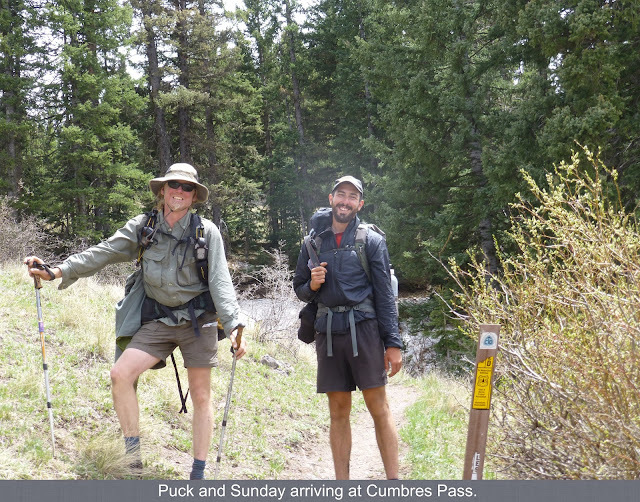 People come from all over the world to ride the train and hikers can do the section from Chama to Cumbres Pass for $25. It runs once a day and drops hikers off right where we came off the trail. Both Sweetfish and Ninja decided to take a zero in Chama today to ride the train to the trail tomorrow. We will see them in the next town when we get to Pagosa Springs. After the post office this morning, we all sorted out what we needed for this next leg that will be our first snowy section and consistently stay at high elevation. I am so thankful to everyone who is supporting me on this trip! I want to be sure to give recognition to my family in Southern Illinois who had the tedious task of doing my resupplies. My stepmom Robin did this for me on the PCT and has again offered to help along with my step sister Katy. I know they have put a ton of effort into this and that it’s quite a difficult task. THANK YOU Robin and Katy! 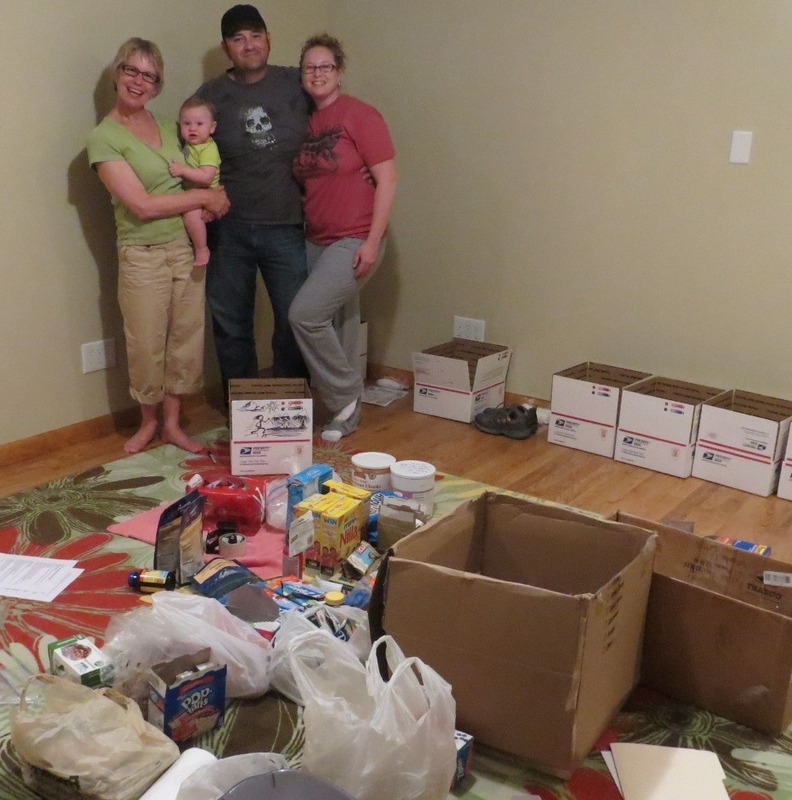 Here is a picture if the two of them in the room set aside for my resupply boxes with Katy’s daughter Maddie and her husband Chad. THANK YOU!!! We all depend on our resupply people and I also was to thank my friend Megan who has been sending me things I left in Portland that have needed to be mailed at the last minute like my snow baskets and tent stakes. THANK YOU Megan! In my current resupply, I got my snow gear which you can see below. I got my ice axe which will help on steep traverses in the snow…especially if I slip and need to self arrest(stop myself from sliding down a snowy slope). I am wearing my microspikes in the picture which will help with grip on early morning icy hiking. I also saved two of the Mountain House meals from Chris and Charles specifically for this leg knowing it would be a draining one and that it would be heaven to not have to cook or wash a pot out at the end of a cold day. THANK YOU Chris and Charles. I got a surprise Mountain House from Kevin (aka Mule) in Portland and that was wonderful. In fact I ate it tonight. Mule, if you are reading this, please email me as I’d like to properly thank you personally and with all the excitement I threw out your return address. You’ll also notice some Reeses in the picture. My aunt Edie and Uncle George have supplied me with at least one of these in every resupply. The cookies there are my favorite Girl Scout cookies, Thin Mints, from my dad who has added the perfect amount to many if my recent resupplies. I have to say the Reeses and Thin Mints are usually devoured before I even hit the trail! THANK YOU Edie, George, and Dad! You will notice I also get my Entertainment Weekly subscription regularly in my resupply boxes. Well, I had to share this photo of the magazine Sweetfish’s friend sent in his resupply today! Hilarious! Another very special gift that we all got was from the maker of Dirty Girl Gaiters, Dirty Girl. 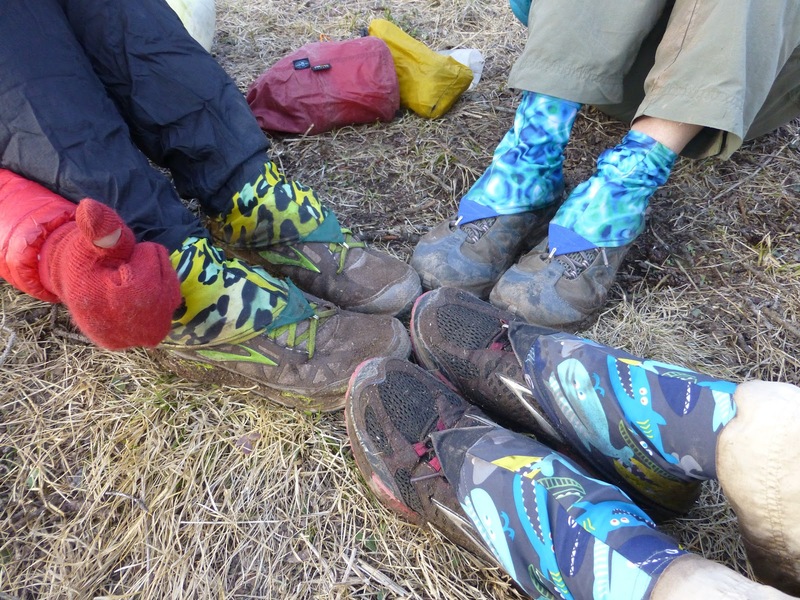 She had already supplied me and LoveNote with donated gaiters before the hike that we absolutely love! A bit ago, she sent me an email that she had a new gaiter that matches my green and blue colors that I wear and that she’d also like to supply the rest of the crew I’ve been around with gaiters. I’m bummed I didn’t get a shot of all of us together, before we split, but here are the ones that LoveNote, Drop-N-Roll, and I had on today. They all have fun unique names and the gaiters are designed for men and women. They are really fun and you should check them out at www.dirtygirlgaiters.com. I think the new pattern she sent me to wear should be named “WIRED” too;) Also, Dirty Girl got me a subscription to and audiobook site where I’ll be able to download a new audiobook every month. If anyone knows any good audiobook recommendations for the trail, I’m taking suggestions. Nothing I have to focus on too much, but fun for the trail to pass the time. THANK YOU Dirty Girl for being so supportive!!! Okay, on to the hiking for today. We didn’t start until 2:30pm with all there was to do. 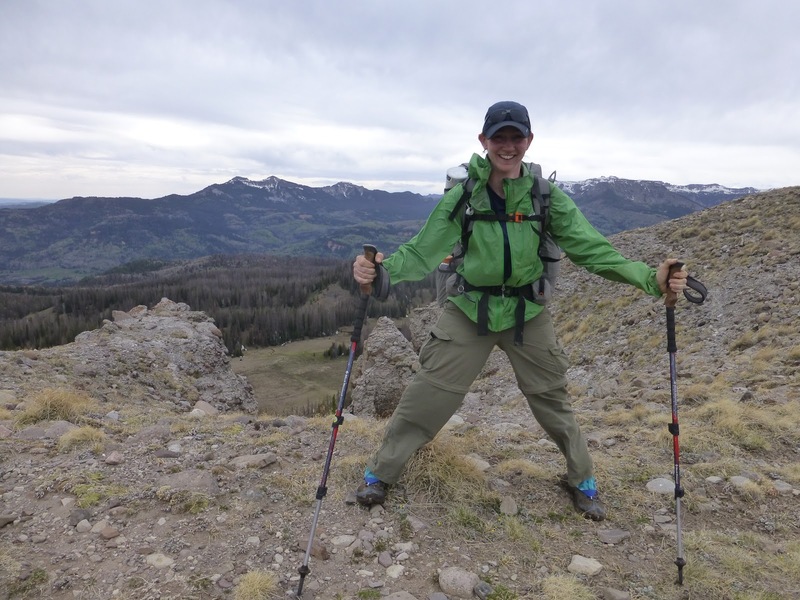 Beacon, who is a triple crowner and has already hiked the CDT, is just having fun this summer and is enjoying both hiking and supporting all his friends along the trail. 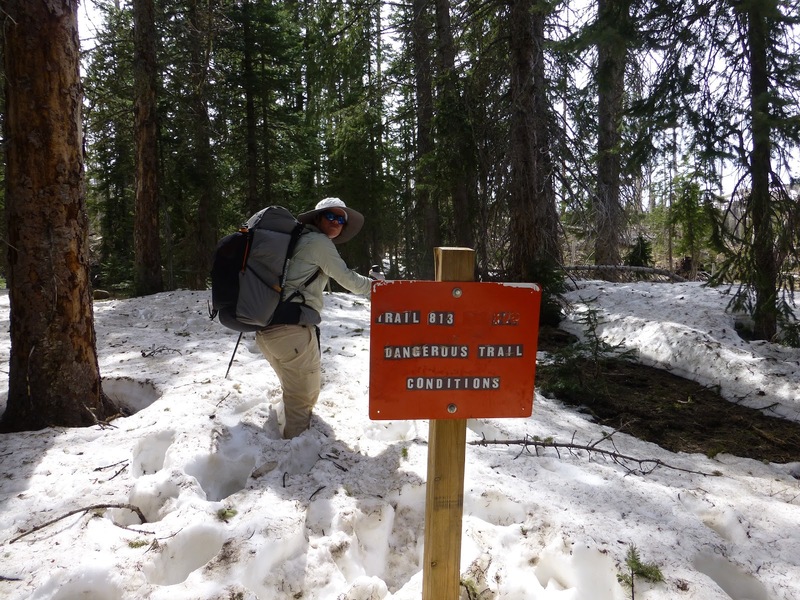 He is mainly supporting Balls & Sunshine, but while they are on the trail, Beacon has been helping all the other hikers and was everyone’s chauffeur in Chama. He knows everyone and is amazingly giving. Stryder’s hiking pole somehow fell out of the car today and was later found, but Beacon already gave him hiking poles to use through this section. So great! Beacon gave Stryder, Drop-N-Roll, LoveNote, and I a ride back to the trail this afternoon and as soon as we stepped out of the car, I heard someone yell, “Wired!” It was Puck and Sunday arriving from the trail and Beacon was perfectly there to shuttle them to town. I will see Beacon in a few more days when we get to Pagosa Springs and he plans to assist us again. Beacon is absolutely awesome and carries treats in his car for hikers along with a hiker box of extra food and town supplies like shampoo and detergent that we all pass to one another. He is having a ton of fun doing it too! THANK YOU Beacon for being so AWESOME!!! Speaking of awesome, we only hiked in 8.8mi today, but it was great! What a way to kick off Colorado and the Southern San Juan Mtns. 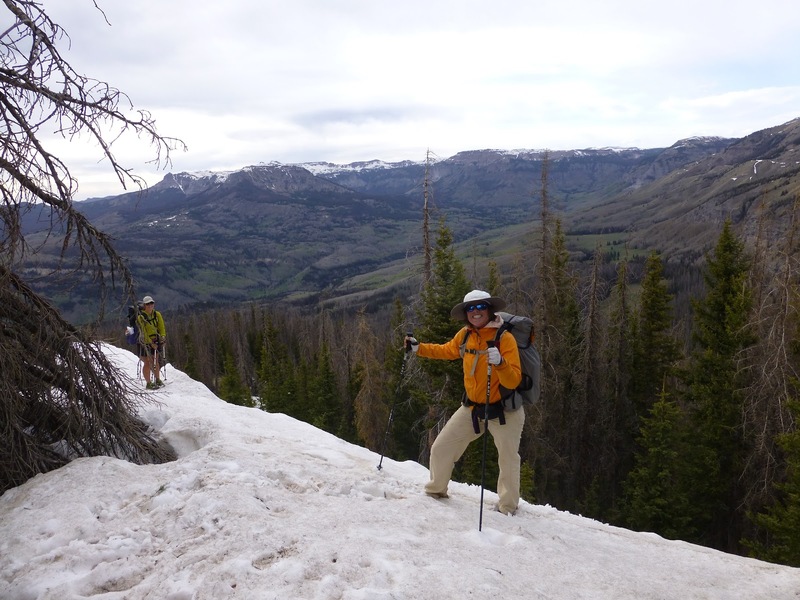 There were patches of snow, and we climbed almost 2,000ft to a great sheltered area just below Flat Top Mtn. We are camped at 11,400ft and will go over Flat Top first thing tomorrow morning taking us over 12,000ft for the first time on the trail. Here is a picture of us looking at Flat Top. Notice the badass ice axes too! We chose to camp in the trees to the right below the mountain for good shelter from the gusts. It is very gusty and cold, but we are in a good spot and I feel toasty warm. Getting out of this tent tomorrow morning will be a challenge as it is quite cold and well below freezing with the wind. I again have my backpack propped up on the mesh door of my tent to help cut down on the draft as the wind is coming from all directions. We are in a great spot and well sheltered in the trees though. It’s just drafty. We chose to stop before going over Flat Top since we weren’t sure how long it would take or how the terrain would look for camping on the other side. It was really fun and entertaining start to the leg though. I took more pictures in the last 8mi than I have on some full days out here!…and we know it’s only going to get more amazing! It was super windy up towards the top and I could barely stand still! My shoes are still dry and I’m sure that will change tomorrow as we are expecting to be in more snow each day…we are hoping the slight chance of thunderstorms tomorrow remains slight and that we dodge whatever is coming through.